Following a sell-out season at the Sydney Opera House and the Edinburgh Fringe Festival, Hairy Maclary and Friends, will be springing off the page these Easter school holidays live on stage in Ringwood, Moonee Ponds, Geelong and Bendigo. 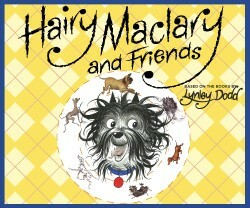 Hairy Maclary and Friends is an adaptation of the much-loved Hairy Maclary children's books, by celebrated writer, Lynley Dodd. Out of the gate and off for a walk, went Hairy Maclary from Donaldson’s Dairy. Anyone with young children will recognize these immortal words instantly as the opening lines of the book Hairy Maclary from Donaldson’s Dairy by Lynley Dodd. Featuring the characters from the books like Hercules Morse – as big as a horse, Bottomley Potts – covered in spots, Schnitzel von Krumm with the very low tum and Scarface Claw, the toughest tomcat in town. With music, singing and some of your favourite Hairy Maclary stories, this show is a must-see for the whole family.